As it’s not the kind of issue that even a student of biblical studies is likely to encounter, let alone anyone else with a serious interest in studying the Bible, I thought I’d use this “nuts and bolts” blog to provide a basic outline of the King James Only movement. It’s a break from previous episodes in the nuts and bolts series, which have all been about subjects in philosophy, but I always said the series would branch out into other areas. There’s an obvious sense in which this is not really a KJV “only” stance in the way that the others in this list are, as this is simply a matter of preference. This is the position that the KJV’s underlying Hebrew and Greek textual basis is the most accurate, and so the KJV is better than any version that has a different manuscript basis. Here, the traditional Hebrew and Greek texts that were used to translate the KJV are believed to be supernaturally preserved. Any variation from the manuscripts that were used to translate the KJV is seen as a departure from the word of God. This is s stronger version of the textual argument. According to this view, the KJV itself was divinely inspired. The translation itself is preserved by God and as accurate as the original Greek and Hebrew manuscripts found in its underlying texts. This group maintains that the KJV is itself the standard from which all other translations originate, and as a work inspired by God it may be used to correct extant Greek and Hebrew manuscripts. This view is often called “Ruckmanism” after pastor Peter Ruckman, who advocates the view. This list does not quite exhaust the options. For example, Doug Wilson preaches from the King James only, and in this brief interview he explains that his reasons are 1) he thinks the manuscript basis of the KJV is the best (i.e. the “received text only” position), 2) He prefers the literal translation style of the KJV (although he accepts that some modern versions have this as well), and most importantly, he says 3) the ecclesiastical argument: The KJV was a translation carried out and owned by the church, whereas the copyright for modern versions is owned by big corporations. I was a little surprised to see this argument, since the KJV, as far as I am aware, was owned not by the church but by the crown, which owned – and still owns – the copyright. Some people who hold to any one of the positions that might fit under the heading of “King James only” have taken exception to the use of that label. Donald Waite has called the label a “smear word,” and in recent conversation I was told by someone upset at my use of that term that it amounts to a “theological slur.” It’s true that people don’t like to be labelled. There’s a sense in which I don’t like to be called a “Calvinist,” but on reflection I can accept that the label is a reasonable one, largely for reasons of convenience. The same is true of some who hold the traditional doctrine of hell as eternal torment being labelled “traditionalists.” Some have indicated that they don’t like the label, but they nonetheless understand that it makes sense. So too on this issue, the label “King James only” is neither a slur nor an attempt to smear anyone. According to a large heading at the website of the Dean Burgon Society (http://www.deanburgonsociety.org) (a group that advances the King James only position), “The God-honored Authorized King James Bible has been, and continues to be, the only accurate English translation of the inspired, inerrant, infallible, and preserved original Hebrew, Aramaic, and Greek Words of God for the English-speaking people” [emphasis added]. Far from being a smear or slur, then, the term does nothing more than take advocates of the position at their own word. It is a fairly accurate way of summing up the fact that for some people, the King James Version and only the King James Version has a certain status among English versions of the Bible. G.A. Riplinger objectively and methodically documents the hidden alliance between new versions and the New Age Movement’s One World Religion. 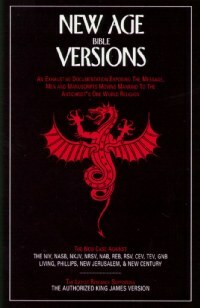 If you only read one book on the version issue, THIS IS THE BOOK! It is so powerful – the devil despises it. The well-known tract author Jack Chick too feeds this sort of conspiratorial view of modern Bible versions, publishing several tracts that specifically condemn modern Bible translations as an infiltrating work of Satan in corrupting the word of God. See his tract, “The Attack” HERE. In it, he depicts (in his cartoonesque way) the way that modern Bible translations are an “attack” on God’s truth. His website contains a section where you can purchase books that present what is described as “Information on Bible Versions,” but which is fairly obviously a polemic on why modern versions are unreliable and only the King James Bible is acceptable, featuring such titles as Let’s Weigh the Evidence: Which Bible is the Real Word of God? and Why the KJV is the Perfect Word of God. Fortunately, the views of many advocates of the KJV do not resemble this sort of bizarre scaremongering. Typographical errors (attributed to the rush to complete the work) abounded in the published text. Erasmus also lacked a complete copy of the book of Revelation and was forced to translate the last six verses back into Greek from the Latin Vulgate in order to finish his edition. Erasmus adjusted the text in many places to correspond with readings found in the Vulgate, or as quoted in the Church Fathers; consequently, although the Textus Receptus is classified by scholars as a late Byzantine text, it differs in nearly two thousand readings from standard form of that text-type, as represented by the “Majority Text” of Hodges and Farstad. Unfortunately, it was not just passages that were lacking in existing manuscripts that Erasmus adjusted. For example Erasmus added the notorious “Comma Johanneum” to the Greek text in his third edition, even though he knew full well that it did not exist in any Greek manuscripts that he had access to. It existed in the Latin Vulgate, however, and not to include it in his Greek New Testament could have been construed as an opportunity to accuse him of not supporting the doctrine of the Trinity. This is not the place (and nor do I have the time or the inclination) for a very lengthy discussion of the discipline of textual criticism, but I take it as fairly well established that Textus Receptus is anything but the best representation of the Greek New Testament insofar as textual accuracy is concerned, and for that matter depending on the Byzantine textual tradition – on its own, at least – is a less dependable way to study the Greek new Testament than to use eclectic texts that draw on a wider variety of manuscripts – especially those that pre-date the Byzantine manuscripts that we have access to by centuries. Technical issues of text criticism aside, however, part of the real problem that I see in the “King James only” stance is that it introduces an unnecessary and unhelpful bias. I have found in my own experience that in discussions over various possible translations of Greek sentences, phrases or words in the New Testament, the more strongly a person is committed to their King James only stance, the less relevant the evidence becomes. So long as a line of argument is available that results in favouring a translation that is offered in the KJV, no matter how strained that line of argument may appear to outsiders, that line of argument will be favoured. In effect, the KJV becomes the yardstick with which arguments about exegesis and textual criticism are assessed. For example, in what is actually a fairly common such list, pro KJV website “Dial-the-Truth Ministries” enumerates cases where the NIV differs from the KJV. The NIV reading is criticised in each case, not on the basis of comparison with the available Greek manuscript evidence, but because it differs from the KJV. Often this takes the form of containing fewer words than the KJV, where the KJV verse includes extra words of praise or an extra title for Christ, and the NIV does not. The explanation is given that the NIV is removing from the word of God (in fact at the top of the page there is a picture of a man cutting bits out of what is presumably the Bible). In other words, the KJV is being treated like “the Bible,” and any text that doesn’t include everything that the KJV includes is deemed to be subtracting from the Bible. Alpha and Omega Ministries – The articles section is currently being converted to a new format, so I have linked to the main page instead. Readers who are familiar with the issue are welcome to suggest further resources. Posted on June 6, 2010 June 12, 2018 by GlennPosted in nuts and bolts, theology and biblical studiesTagged Bible translations, crazy beliefs, KJV, nuts and bolts. “Modern” translations of the Bible are derived from a hodge podge of manuscripts which do not always agree with each other and the choice of which to choose when deciding on how the text should read is sometimes somewhat arbitrary. The Church has held the scriptures fast since the time of the Apostles and if you want the original Greek text that is where to look – which would be the Byzantine Texts held by the Church and indeed they were the source for the King James translation. In fact there are Bibles available where the translations are down right bizarre. Andrei, I don’t know how fair it is to say that choices between variant readings in the wide range of manuscripts available (including variants within the Byzantine texts, incidentally) are ever really “arbitrary.” As far as I can tell (and I admit that my experience in text criticism is not vast) there is always some reason given for the reading that is chosen – and any good edition of an eclectic text (like UBS or Nestle-Aland) gives the alternative readings as well, so they don’t hide the variants from the reader. And yes it’s true that there are Bibles where the translation is bizarre – but that is not because of the manuscripts used. That’s because of the translation philosophy at work. Your opening comments and closing remarks speak for me. My roommate mentioned that many people at the homeless-house he works are KJV-Onlyists. I thought it was absurd beyond absurd. It is such an indefensible view that no one in my circle of academics -even considering the various Christian colleges in my area- would even consider. No one bothers to defend it or refute it. Like much of fundamentalist “argument” this KJV only rests on argument without any facts. To merely say it is the “one God endorses” is to say not anything at all. I have tried to get to the bottom of this for years, and have come to only one conclusion–the KJV offers a translation that says what the reader wants to find–support for his/her own personal opinion on things. Otherwise, seemingly intelligent people cannot simply refuse to consider the actual EVIDENCE to the contrary. But that is what is true of fundamentalism in general–it’s all wrapped in psychological need as opposed to actual critical thinking. I have had a KJV since childhood, so it is my translation of choice. I think it’s perfectly fine that other translations are used. There are some translations that I must oppose, like Eugene Peterson’s The Message. It may be a case of my own ignorance, but I struggle to understand the need for the abundance of translations and even the need for more translations that come and will be coming. I question the motive. Probably my lack of understanding and natural skepticism. I admit to be confounded when I hear some preachers reading from different translations in their sermons. I question the motive and honesty the speaker, again probable a case of my faults and natural skepticism. I guess it is more accurate to call The Message a paraphrase. Sorry. “All translations are adequate, none are perfect”. A translation is by nature, flawed. It is never as “perfect” as the language it was TRANSLATED from.. and more importantly, if you could understand the original languages, and read the original monographs and talk to their authors, you would STILL misunderstand what they said… for goodness sakes, the amount of people who misunderstand what Glenn writes on this blog alone, and then argue with him when he tries to correct them is astounding..
We need ALL the tools available to us to make sense of Scripture. We need many of the tools we have been given, but not all of the tools available. Some tools are counter-productive. Here’s what Spurgeon had to say on the matter, and I think he hit the mark. There are different meanings of the Greek word ‘paraclete’, which is translated here as “Comforter”. Early translators employed transliteration, having left the original word in the Greek but translated it into or alphabet to form the word ‘paraclete’. As a name of the Holy Spirit, ‘Paraclete’ has some other meanings besides “comforter”. Frequently it means “monitor”, “teacher”, or “instructor.” Often it means “advocate,” but the most common meaning of the word is “comforter.” Still, we can’t pass over those other meanings without saying something about them. Jesus Christ had been the official instructor of His saints while He was on Earth. They called no man Rabbi except Christ. They sat not at the feet of men to learn their doctrines, but they heard them directly from the lips of Him who spoke as no other man has ever spoken. When Christ was to leave, where would people find another infallible teacher? Should they go to a Pope in Rome to be their infallible oracle? Should they lean on the councils of the church to decide all knotty points? Christ said no such things. I’m probable getting off subject. Humble tradesman out. “The Spirit” would be a “tool” – although thats not technically the right word 😛 And I dont mean he is on a reality TV show. When trying to understand Scripture there are a whole bunch of things that need to be in place, not the least being “the illumination of the Spirit”. In saying that though, the Holy Spirit will not teach you something that is not there (because that would be untrue). If something is true, biblically or in ANY book, the methodology used to arrive at that “truth” must be demonstrable, repeatable, etc. The Spirit is a factor, but if ANYONE (Christian or not) can not see how you arrived at your understanding, well.. thats just bogus. The danger is when we (which happens ALL THE FLIPPIN TIME THESE DAYS) exclude “study” because “spirit led” is better. Fact is, without study, “spirit led” can be pretty much just about anything. I think it was said best in a hermeneutics book I read years ago. Who is more presumptuous: the person who who spends years reading and learning what other people have said about the Bible and how to understand the Bible, or the person who feels he has such a good connection with the Holy Spirit that he need not know what the Holy Spirit has revealed to others? You are right. And those weren’t my words, I was quoting Spurgeon. The point I was trying to make was that some tools (Geoff said ALL tools are needed) are not needed. Tools ARE good and very important for one to grow in Christ. I use study tools all the time. The most important teacher, and no one will argue this, is the Holy Spirit. He will make us to discern the good tools from bad tools, and make sure we get the right tools made available to us. I also don’t think the Bible should EVER take a back seat to anything, and we know well that people do often give their “personal revelations from the Spirit” as bigger than the bible as if some new revelation from God has been given to them. But the canon is closed in that regard. Ultimately, God uses people, and the Holy Spirit is a big part of all we learn. Thank you and Geoff for making sure I wasn’t disregarding the many tools that God has given. I have lots of holes so I’m often unclear, sometimes wasting time, and sometimes going in the wrong direction. Thanks. Daniel Wallace offers some interesting insight into the Comma Johanneum. This longer reading is found only in eight late manuscripts, four of which have the words in a marginal note. Most of these manuscripts (2318, 221, and [with minor variations] 61, 88, 429, 629, 636, and 918) originate from the 16th century; the earliest manuscript, codex 221 (10th century), includes the reading in a marginal note which was added sometime after the original composition. Thus, there is no sure evidence of this reading in any Greek manuscript until the 1500s; each such reading was apparently composed after Erasmus’ Greek NT was published in 1516. Indeed, the reading appears in no Greek witness of any kind (either manuscript, patristic, or Greek translation of some other version) until AD 1215 (in a Greek translation of the Acts of the Lateran Council, a work originally written in Latin). This is all the more significant, since many a Greek Father would have loved such a reading, for it so succinctly affirms the doctrine of the Trinity. The reading seems to have arisen in a fourth century Latin homily in which the text was allegorized to refer to members of the Trinity. From there, it made its way into copies of the Latin Vulgate, the text used by the Roman Catholic Church. I just don’t understand how people can cling to the KJV in the face of such publicly accessible and clear evidence! It’s such dogmatism and wilful blindness. Dave, I think it’s simply evidence that sometimes people who get caught up in … I’m trying to think of the right word – not necessarily “cult” mentality, but highly idiosyncratic forms of belief, maybe “group think” is a good term – decide which evidence to listen to and which evidence to suppress or ignore largely based on decisions that they have made prior to examining the evidence – decisions that prevent them from handling the evidence fairly. I guess we could call this “pre-cognitive judging.” Most just call it bias. Now it’s obvious that I’ve made decisions about the KJV-only movement, but I’d hate for anyone to think that I made those decisions before examining the beliefs of the group(s). The fact is, as a younger (and with all due respect to them – a less intellectually mature) person, when I first encountered the writings of the movement I was a little bit excited by them. I actually took a lot of it on board and shared my pro-KJV views with others. I ended up rejecting the movement and holding it in such intellectual disdain as I now do after finding out a lot more information on the issue. I think the KJV-only movement is guilty of this kind of bias, and the way they handle (or do not handle) the evidence surrounding the Comma is a classic case of just that. Glenn was blocking my posts from “Andrew Patrick” and my email address. If this posts with the different name and email link, that’s proof. Rather, it seems that Glenn will cannot tolerate to face the evidence on the 1 John 5:7 issue. That has to be your most dishonest stunt yet, Glenn. OK people, let’s have this out once and for all on 1 John 5:7. Now, assuming Glenn hasn’t blocked this by site, this may get posted, and if so, the original post will follow in the same manner. Dave, or anyone here, read what is at these links. Dave Wallace is hardly being very honest with this subject. If, for some reason, this does post correctly, without delay, then I probably jumped to a conclusion and falsely accused Glenn above, and made the mistake of taking him at his stated word above, that he would actually carry through with what he said in the above quote. The original post “Previews” correctly. It is not terribly long, and it has less links than other posts I have made on this same interface. And of all things, that Glenn would start taunting that people cannot handle the evidence on 1 John 5:7? This timing is all certainly suspicious. It seems that you are vindicated, Glenn. You were not carrying through on your bluster, unless WordPress grants you some sort of control to ban posts with specific text, or of a certain length. I apologize. If you fight on this, you shall lose. In an attempt to introduce myself, it seems that Glenn is specifically trying to target me with this blog article. From another blog, he noticed that I used the King James text as an example of the classic “to day shalt thou be with me in paradise” and he started trying to assign a label of “KJV-Only” to me. Now that the background context of his blog article is realized, I would address some of these statements on their merits. There is really too much to address all at once, but since there has been so much smack-talk about “serious scholarship in theological and biblical studies” let’s address Erasmus, the Textus Receptus, and 1 John 5:7. The “received text” or Textus Receptus is the name given to the Greek New Testament, compiled by Erasmus, from which the KJV was translated. By itself, this might seem like a harmless error, but it shows sloppy scholarship, and considering the bald-faced arrogance already shown, it shall not pass. Thirty seconds with Google (or any decent book on the subject) would have provided this information. At this point it is hard to evaluate what he means by the rest of his paragraph… is he referring to the text used for the translation of the Authorized Version, or does he mean the text compiled by Erasmus? Unfortunately, it was not just passages that were lacking in existing manuscripts that Erasmus adjusted. For example Erasmus added the notorious “Comma Johanneum” to the Greek text in his third edition, even though he knew full well that it did not exist in any Greek manuscripts that he had access to. Concerning the “made to order” myth perpetuated by Dallas Theological Seminary (and Wikipedia, etc) that story is even now disavowed by Bruce Metzger. However, as has now been admitted by Dr. Bruce Metzger, this story is apocryphal (The Text Of The New Testament, 291). Metzger notes that H. J. de Jonge, a respected specialist on Erasmus, has established that there is no evidence of such events occurring. Therefore, opponents of the Comma in light of the historical facts should no longer affirm this report. One piece of disinformation which has served to bolster the belief that Erasmus relied on little to no Greek manuscript support is the continued misrepresentation of the Greek witness which Erasmus himself said that he used. Modern scholars will claim that Erasmus included the Comma on the basis of the Codex Montfortanius, said to be the hastily prepared Greek codex which was produced to give him the pretext for including the verse. Erasmus states that he included the Comma into his third edition based upon the witness of the Codex Britannicus, a separate Greek codex. Scholars will attempt to equate Britannicus with Montfortanius, but this is not legitimate, as the rendering of I John 5:7-8 in Erasmus’ edition is different from that found in Montfortanius21. Further, Montfortanius itself could not be the supposed ringer which the Erasmus’ Promise myth suggests, as it is dated by scholars such as Adam Clarke to the middle of the 13th century22. So why is Glenn claiming that the text of 1 John 5:7 was applied to Erasmus’s third edition without basis in any Greek manuscript? I think it does not even deserve a seat at the table of serious discussion about the Bible. I would like nothing better than for its advocates to be edged out of any and all scholarly endeavours, only to come back when they have set aside their absurd beliefs and are willing to learn. How … typically Calvinist. It reminds me of the Synod of Dort. 1. Have you researched the Greek manuscript evidence for 1 John 5:7? 2. Have you researched the Latin manuscript evidence for 1 John 5:7? 3. Have you researched the its quotations from the early Greek fathers, which date back far beyond even the oldest manuscript? 4. If you consider the original autographs to be inspired, have you considered that the grammar of the Greek is flawed without the full text of 1 John 5:7? 5. Have you considered internal evidence for 1 John 5:7? If this all sounds strange to you, then consider that you have probably not seen all of the evidence. If you oppose this scripture, you need to reconsider. If you are not sure about its authenticity, you need to arm yourself against the type of attacks you can expect from folks like Glenn. So it seems that 1 John 5:7 is where the battle shall be fought. Very well then. Glenn suggested that more sources could be posted. Here are a couple that are relevant to this subject, and should be more than sufficient to quell the misinformation propagated by Wikipedia. I’ll give you a quick summary: the full text of 1 John 5:7 is valid, genuine, from the original autographs, and although it may have suffered in many of the Greek manuscripts, it possesses a solid, wide and varied range of support, as would be expected for any minority text that would be included in our Bible. I don’t have space to put it all here right now. If you want more, please follow those two links. In case anyone is interested concerning what Bible they might find that contains the full text of 1 John 5:7, your options are pretty much restricted to the Wycliffe translation (if you read Middle English), the Douay Rheims Catholic translation, or any of the Received Text translations such as Tyndale, Bishops, Geneva, or the King James. These studies have been done before, and the information would be available to any genuine scholar. Yet, consider the methods you have seen Glenn demonstrate: for the most part, repetition of propaganda and “ad hominem” attacks. That is, if you are to seriously consider any of the issues, you will be called stupid, ignorant, wicked, devoid of scholarship… an intellectual black hole. Glenn has even gone so far as to wish anyone who could support any of these issues on their merits should be banned from the academic community. Now I imagine that Glenn would love to attempt to paint me with a broad brush, and try to associate me with any number of strange ideas. He is also proving that he has a very closed narrow-minded perspective, and I doubt that he would be able to objectively evaluate anything with which he does not already accept. It is so much easier to apply the slur and be done with it. Perhaps there are other issues that would be worth discussing. But if there is one thing that I’ve learned, it is senseless to try to seriously talk with a raving bigot that worships their own intellect and who refuses civilized rational discussion. Glenn, it would be really nice if you would come around. Addendum: By the way: Any ideas on why your blog would display the “Preview”, accept the “Send”, refuse to post, and then reject an attempt to resend saying it was a duplicate post? Sorry. I misread your post as an endorsement of Spurgeon. Daniel Wallace is not only withholding evidence, he is lying. The text of 1 John 5:7 appears in Codex Wizanburgensis which is an 8th century manuscript. This is all the more significant, since many a Greek Father would have loved such a reading, for it so succinctly affirms the doctrine of the Trinity. Cyprian wrote, in 285 A.D.
“The Lord says, ‘I and the Father are one’ and likewise it is written of the Father and the Son and the Holy Spirit, ‘And these three are one’. That is a sight bit earlier than the 1215 claimed by Wallace, or his story about a 4th century Latin homily. There’s a few more quotes from the Greeks as well, which Wallace seems gladly ignorant of. Priscillian wrote in 385 A.D.
“And John the Evangelist says, . . . ‘And there are three who give testimony in heaven, the Father, the Word, and the Spirit, and these three are one’. If you are wondering why it would not be cited more often by Trinity advocates, get a Bible that has the verse, and read this particular passage more carefully. Did anyone mention that only about 10% of Greek manuscripts contain the book of 1 John to begin with? OK Dave, I think I’ve given you enough bait. Why don’t you start with those two links I gave, and then we can discuss the integrity of the text once you are familiar with the base issues. No one is denying that it is a minority reading in the surviving Greek manuscripts. Take a good strong look at this Dave, because you may find out that there’s a lot of misrepresentation and dishonest scholarship out there that specifically dislikes this verse. They all have horses in the race. On the other hand, I could point out that the links I have posted are public also, and you have never availed yourself of them. Should I accuse you of dogmatism and will blindness? No, I shouldn’t, at least not unless you refuse to look at the links and discuss the material. Let’s discuss the non-Greek witnesses. Or its early references or quotations by the Greeks. Or let’s discuss the grammar issue: how come the Critical Text suffers an egregious grammatical error from its absence, where the Received Text that contains the full passage does not? Wallace won’t tell you about any of those. So anyone who presents alternative views is “lying”? Andrew, seriously, when you resort to rejecting alternative views that way you just confirm what I suspect of KJV-only advocates. As for your talk of “a raving bigot that worships their own intellect” – this alone is sufficient reason to simply roll my eyes and ignore you forever. You’re obviously not serious about listening to anyone, any more than you think I am. Just look at the way you carry on! You’ve spent considerable time reproducing the way that you would respond to an argument that nobody has made here, an argument about Codex Montfortanius. But I don’t see why you would do this when nobody has mentioned it. Looking at your citations from the fathers, they appear to confirm what I have seen, namely that the specific verse is only evidenced from Latin sources from the fourth century. Cyprian does not quote the verse at all, as you know, and may well be simply drawing on the allegory that Wallace speaks of, which eventually found its way into Latin copies of the Epistle. So as far as Patristic evidence goes, your evidence conforms to Wallace’s claim nicely. So much for that attack on his character as a liar. You obviously didn’t know this. Now you do. Rather than fly off the handle and accuse you of lying, as you unfairly did to Wallace, I will simply ask that now that you realise this, you change your mind about extant Greek manuscripts that contain this Comma. 1) First you seem to imply that Codex Montfortanius was a “straw man” argument. Answer: This is hardly the case. This was in evidence to demonstrate that even the hostile portion of the academic community has long acknowledged that Erasmus used Greek authority for his 3rd edition. The only debate was not whether he used Greek authority, but rather which Greek manuscript he used for authority. I really have no clue how you came up with your argument that Erasmus produced his 3rd edition without a manuscript. You didn’t answer that. a) First, I don’t see any supportable evidence for his “allegory” theory. b) Second, he has omitted other evidence from consideration that would substantially harm his theory. If he was ignorant of such, he has not gone to any effort to research it, or address it, and he claims to be a theological scholar. c) I am already familiar with other writings of his. This is the same Daniel Wallace of Dallas Theological Seminiary that I reviewed some years ago. He was very untruthful in his speculations about Erasmus and propagated a lot of false information that I still see circulating today. No one contests that the first reference to John 10:30, even though he simply prefaces it with “The Lord says.” After citing one scripture, he is citing a second scripture, and he specifically says “It is written” with the same preface that Jesus and Paul would use to introduce scripture so often throughout the New Testament. Maybe you can convince me that you are attempting to be objective here. He could only say this if he was omitting whole classes of evidence, including the grammar of the majority Greek text of 1 John. However, if we are only considering this paragraph (and not his other articles, which I admit did influence my evaluation of his scholarship and/or character) then he should be allowed the benefit of the doubt. a) If it means that you are simply responding in-line, I will point out that you didn’t respond to everything. b) If you mean that I have “no other case” then it seems you misunderstand why I introduced the Codex, and/or you are not aware of the scope of evidence we are talking about concerning the question of the integrity of a Greek minority reading. Why did I introduce the Codex? – It is a relatively early codex, of which I have only seen another five listed that would qualify as being older. Most of the “Majority Text” that omits 1 John 5:7 in the Greek is relatively late, something which its critics often neglect to mention. – It appeared to directly contradict the statement by Wallace. 6) I would like to see a picture of Codex Wizenburgensis. I have seen some people refer to it as a Greek manuscript, and your author calls it a Latin manuscript. Although your author says he has a picture of it, there is nothing behind his web link. Though thinking about this I suppose that anyone could show me a picture of any Latin manuscript and I would have to take their word for it as to its identity. However, I will point out that his repetition of the “gloss” myth does not help to establish his objectivity. Whether or not the Codex is Latin or Greek makes little difference to me personally, because I evaluated this on subject before without being aware of this particular Codex. However, if it is [entirely] a Latin manuscript, it would help vindicate Wallace’s statement, and if others have made a mistake on this instead, even small mistakes need to be corrected. So, until that particular point can be determined, I will put myself in the “agnostic” category concerning the language of that particular manuscript, and Wallace gets the benefit of the doubt on that point. 1) It is quite possible that anyone might make factual errors from time to time. For example, I “caught” you concerning whose Greek text was the source for the Authorized Version, and it is possible that I may have confused a Latin Codex for a Greek Codex. So here is a proposal. Even if someone presents themselves as a “infallible scholar” and gives bad information, I will try to avoid speculating that they are purposely lying. In exchange, when someone does not present themselves as an “infallible scholar” and repeats bad information, you should give the same benefit of the doubt. 2) Are you seriously willing to try to set aside any preexisting prejudice against 1 John 5:7 and evaluate the full scope of evidence? There are whole classes of evidence being withheld by the theological types here, yet in the case of a Greek minority reading, it is precisely these sources to which we should expect to turn. I don’t think you read either of the links I posted so far. If you have not, can you truly say that you are trying to evaluate all available evidence? For example, I would not be surprised if you were unaware of the Greek grammatical problem that occurs when the full text is omitted. And, would you please clarify: do you believe that a reading must always be present in the majority of all extant (surviving) Greek texts in order to be legitimate? Or is it possible for a Greek minority reading to be correct? 3) Please do not use your blog platform to launch broad-brushed attacks against whole categories of people. You were quick to stand up for Wallace, but compare the types of statements you had already made? Some of them sounded positively Nazi. Inflammatory language of that type does tend to inflame, and it is unfair to pretend that you don’t know why people might become upset with you after that type of smack-talk. If they are lured into “responding in kind” it is unfair to forget that their behavior was provoked. Nor did your approach do anything to engender legitimate “scholarly” discussion, or to demonstrate to anyone you might disagree with that they might be treated fairly. I said earlier that I forgive easily. I wish you would compare what you said on your “Kingdom Theology” blog and compare its spirit with this one. I liked what I saw in that “Kingdom Theology” Glenn. I got a bit flustered when the posting mechanism would not work while people were taunting that “they are all stupid for not looking at evidence.” I am also a little less tired right now, so hopefully this makes more sense. The full text of 1 John 5:7 can also be found in Greek lectionaries 60 and 173. These are indeed “Greek witnesses” even if they are not complete codices. Lectionary 60 dates to 1021 A.D.
Lectionary 173 older, dating to the tenth century. Finally, there are at least two Greek lectionaries (early didactic texts usually containing copious scriptural citations) in which the Comma appears (Lectionaries #60 and #173). This does technically contradict the statement by Wallace. Andrew, I understand that you don’t actually like my view on the KJV only positions that I detailed in the blog entry. That’s too bad on a personal level, but I can’t possibly decide to stop holding it. I hold it not, as you apparently believe, as a prejudice that I brought to the issue. The reality is that – as I’ve indicated in this comment thread – I was once favourable towards some variety of the KJV only viewpoint. I now think, in retrospect and after having seen what I take to be plenty of decent evidence, that the KJV only position is intellectually inept, contrary to fact and not a serious candidate for scholarly Christian attention. We would be well off if we all forgot about it ever existing and got on with sensible thinking. That’s my belief, like it or not. You aren’t able to just change your assessment of those who believe in a flat earth, no matter how much they plead with you to stop being such a bigot. Of course, it’s not bigotry. It’s a perspective that you have learned to be correct from exposure to facts, and you don’t need to endlessly pretend that ridiculous views like that are respectable. That is the position I think I am in when it comes to KJV-only perspectives. First off, we (now) agree, it seems – or at least you’re prepared to agree – that there are no Greek NT manuscripts that contain the Comma prior to the late date that Wallace refers to. You’re now ready to accept that he was right after all. The one example you suggested turned out to be Latin. For some reason you think this mistake is matched by an “error” of me referring to Erasmus. But this was no error, and I was surprised at your comment. Every source that I am aware of cites Erasmus as the first to compile and distribute something we call Textus Receptus. Even KJV only sources say this. For example the Trinitarian Bible Soicety (http://www.trinitarianbiblesociety.org/site/articles/tr-art.asp) notes that Erasmus was the first to distribute this. And Textus Receptus is indeed the basis of the KJV. Therefore what I said was quite true, and there’s no reason to take issue with it. Yes, I know that Stephanus worked on it later than Erasmus, but you will be well aware that Stephanus produced a new edition of what is Erasmus’ work (even that page says this). I don’t even understand why someone would argue about that. If you have some special way of interpreting things so that you can describe Erasmus as not compiling the work that later – yes, with editorial help from later people – became the basis of the KJV, then fine. That’s certainly not how I read things, but it doesn’t change anything. it’s certainly not materially relevant (as is the difference between a manuscript’s being Latin and being Greek). As for this “Codex Montfortanius” business, I never said “straw man,” but it’s certainly a wasted argument here because nobody is making the argument that you want to rebut concerning that manuscript. I should have been clearer in my description of Erasmus’ inclusion of the Comma. Yes, it existed in a manuscript that was provided to him, but he knew better. That’s what I was getting at – he knew that it did not belong, and he only included it when objectors provided him with a Greek text that included it. Now, it’s true that the myth of Erasmus’ promise to the effect of “show me just one manuscript that includes that verse and I promise to include it” has no solid foundation. But this changes very little. The fact is that the appearance of Erasmus’ New Testament without the Comma was a scandal to those who, because of the familiarity Latin textual basis, had come to regard the text as essential for a doctrine of the Trinity. It was Codex 61, written by a friar named Roy (or Froy) from Oxford that was then quickly provided (produced?) and given to Erasmus, ensuring the inclusion of the Comma in the third edition. that the Codex, like many other manuscripts, contained a text which had been revised after, and adapted to, the Vulgate. This was one of Erasmus’ stock theories, to which he repeatedly referred in evaluating Greek manuscripts of the New Testament. He regarded manuscripts which deviated from the Byzantine text known to him, and showed parallels with the Vulgate, as having been influenced by the Vulgate. Second, we agree that absolutely none of the early Greek fathers quoted the Comma. Third, we agree none of the Latin Fathers who use the phrase found in the Comma and who clearly quote it in any context until the fourth century. That brings us to Cyprian, from the late third century. As you know – since you quoted him – he never quotes the Comma (which is why we must agree that no Fathers quoted it until the fourth century). However, you believe that the Comma is what he’s referring to when he says that it is written of the Father and Word and Spirit that they are one. In fact you seem to be quite unable to imagine any circumstances under which he could have said this but not been referring to the fact that the New Testament contains the Comma. But I’m afraid this just shows that you’re not willing to be creative except when defending your own view. Notice that Cyprian says that this was “written of” the Father, Son and Spirit. He doesn’t use it as a proof text that states that the Father, Son and Spirit. He believes that it refers to them. In fact, the example of Cyprian is an outstanding example of how this interpretation of the passage, seeing the three things mentioned as figures or allegories of the members of the Trinity (as in Cyprian, who interprets the text this way but never says that it names the Father, Word and Spirit) just a century later had actually slipped into Latin copies of the text itself, as in Priscillian or Varimadum (whoever he is). So while you seem absolutely certain that Cyprian must have been referring to the Comma, you’ll have to agree that he never quotes it, and can easily be seen as evidencing a move from interpretation to text in what Kraus called the “wild Latin-only transmission” of this gloss (which is what I take it to be). Lastly, you refer to Greek lectionaries, one from the 11th and one from the 10th centuries. Well, I never claimed that there were no such examples. That was Wallace. In any case, as I look at what Wallace said in the section you quoted, he seems to be explicitly referring to “manuscript, patristic, or Greek translation of some other version.” So he’s correct in saying that, but again, it’s nothing to me. Of all the possible places from which to defend Textus receptus, the Comma is probably the worst. You wrote quite a long paragraph explaining how your use of theological slurs, labeling, haphazard categorizing, and inflammatory language does not make you a religious bigot. Yet, I have nothing to judge you by except your actions and your words. If you want to be seen as fair and objective, start acting fair and objective. Your response indicates that you are anything but fair and objective. You have refused to do basic research, even from links that have been put in front of you. This is the mark of one who is scholastically deficient, not of someone who is truly sincere in willing to look at all the evidence. First off, we (now) agree, it seems – or at least you’re prepared to agree – that there are no Greek NT manuscripts that contain the Comma prior to the late date that Wallace refers to. You’re now ready to accept that he was right after all. Absolutely not, Glenn, and you should know better. This shows me that you are either careless in your wording, or biased to where it affects your judgment. A third option might be that you are deficient in the area of mathematical reason. 2) Did you forget that I just demonstrated how Wallace made a false statement in post 24, and I have also maintained that his conclusions that he presents as fact are erroneous and without basis in fact (in the same paragraph, no less?) You do not have my specific agreement, and you shall receive no blanket endorsement of Wallace from me. The way you phrased your question, it seems you were prepared to take any agreement and try to portray it as a blanket endorsement. You cannot change his statement after I’ve proven him wrong, and then ask me to agree with what he supposedly “meant” to say. I shall not say he is a liar, but he does make false statements. As for this “Codex Montfortanius” business, I never said “straw man,” but it’s certainly a wasted argument here because nobody is making the argument … that you want to rebut concerning that manuscript. I should have been clearer in my description of Erasmus’ inclusion of the Comma. Yes, it existed in a manuscript that was provided to him, but he knew better. That’s what I was getting at – he knew that it did not belong, and he only included it when objectors provided him with a Greek text that included it. It was Codex 61, written by a friar named Roy (or Froy) from Oxford that was then quickly provided (produced?) and given to Erasmus, ensuring the inclusion of the Comma in the third edition. Now you are repeating the myth. You just protested that no one was making the argument, and then you go and use it yourself, with scarcely a pause. I don’t think you are even familiar with your own argument. “Most certainly knew better?” That was a dishonest accusation, Glenn, and certainly one that has no basis in fact or evidence. Even a basic reading of the statements of Erasmus demonstrates that he knew it was a legitimate reading, but had not included it because he lacked the Greek text. This, again, is a demonstration of the mathematical fallacy of failing to recognize the difference between surviving evidence and actual fact. You are employing a form of sophistry. It is quite possible that many Greek fathers quoted the text of 1 John 5:7 both in normal speech and in their writings. It would be correct to say that we are not aware of any surviving evidence in the writings of early Greek fathers. Do you understand the difference? I am being objective and implementing basic mathematical reasoning. Your statement is irrational and depends upon an illogical assumption that we have access to every statement spoken or written by every Greek father. This assumption of yours seems to be fueled by prejudice and bias. Glenn, this is an absolutely false statement, and considering what you are responding to, your claim of “agreement” is totally dishonest. You know full well that we have no such agreement. That brings us to Cyprian, from the late third century. As you know – since you quoted him – he never quotes the Comma (which is why we must agree that no Fathers quoted it until the fourth century). Again, what is with these absolutely false statements? You have an observable habit of saying “As you know” and then inserting a statement which your opponent has just demonstrated is false, and then pretending that your version was agreed upon all along. Notice that Cyprian says that this was “written of” the Father, Son and Spirit. He doesn’t use it as a proof text that states that the Father, Son and Spirit. He believes that it refers to them. No, he first says “the Lord says” and quotes John 10:30 and then immediately follows with “also it is written” and quotes from 1 John 5:7. Your introduction of the claim that Cyprian is attempting to “prove” the “Father, Son, and Holy Spirit” is a straw man argument, and irrelevant to the point at hand. It is hard to believe the acrobatics you will go through to try to claim Cyprian is not saying what he is saying. If I understand your argument correctly, it seems that you are claiming that Cyprian is instead referring to the 1 John 5:6, even though there is no reference to anything in 1 John 5:6. Again, I cannot be sure what you are saying, but I think if you actually came out and stated your theory succinctly instead of dodging around it would look plenty silly. Summarizing, your response was intellectually dishonest (it failed to address any of the material points I had raised) and your counter-theory was not grounded in facts or evidence. You have not convinced me that you have set aside your prejudice, or that you are attempting to be objective. You have no such agreement, and your failure to address any of the points I raised does not convince me of your sincerity. Cyprian certainly does quote 1 John 5:7. What were you waiting for, a chapter and verse reference, like “(see I John 5:7)?” Are you forgetting that chapter and verse divisions are not part of the Greek text? Any amount of evidence is irrelevant when speaking with someone who has already prejudiced themselves against considering all evidence and reasonable conclusions. You have not answered material points, you have failed to answer direct non-rhetorical questions, you give leading statements that misrepresent my position, you have neglected to research whole classes of supporting evidence, and your reasoning is biased and irrational. If you were fair and objective and truly seeking to consider all evidence, we would be talking about Greek grammar by now. And if we extended your reasoning fully, we would omit the entire text of 1 John from our Canon, seeing that it has only survived in a small minority (about 10%) of Greek manuscripts. From this statement, I judge that Wallace is lacking in his theological, historical, and exegetical ability. I John 5:7 does not affirm the doctrine of the Trinity, rather it contradicts an opposing argument such as Arianism or Unitarianism. As such, the Johannine Comma would not have been useful in dealing with these heretics. Indeed, saying that “these three are one”, is something to which the Sabellians would have agreed, though for a different reason than orthodox Trinitarians. Sabellians would just as willingly have cited the Comma to prove their position that the three were one in PERSON, not in essence. As such, there is no reason why any early patristic writer would have been inclined to find the Comma particularly useful against this particular heresy. We note that Tertullian, even at that early period in which he wrote, found it necessary to strenuously emphasise that the unity of the three in one was a unity of essence, not person. This is quite explicable in view of the fact that Tertullian was directing his arguments against Praxeas, who held to Monarchian theology. In general, though, the patristics probably would have been disinclined to rely upon these verses to defend the Orthodox view of the Trinity, as the verses could just as easily be turned back against them and twisted to support the Sabellian heresy. We could also obtain supporting documentation from non-Trinitarian sources, including people that describe themselves as Unitarian and Monarchian. However, please remember that this discussion is about the integrity of our source text, not about its doctrinal ramifications. It is obvious to me that you have not attempted to avail yourself of any of the relevant material to this discussion. Your entire aim seems to be to prevent any of the relevant evidence that would be required for considering a Greek minority reading from reaching the public discussion. If you have convinced me of anything, it is that you are not sincere. I find this especially hypocritical considering you were just joining in in accusing so-called “King James Onlyists” of refusing to face the evidence, or being able to make rational decisions. You exhibit the exact same traits that your original blog condemned. Why does the Majority Greek text demonstrate flawed grammar that is resolved when the full text of 1 John 5:7 is included? Are you prepared to say that you do not believe the original Greek text was inspired? Since you will not answer material points, nor direct questions, and your statements lack basic logic, and you refuse to address the evidence at hand, this serves as a sufficient demonstration why these discussions usually get no where, because there is seldom an interest in an honest sincere discussion of the relevant evidence. Andrew, we definitely agreed that Cyprian never quoted the Comma. You personally believe that he must have been referring to it, but he never quoted the section in dispute. As for the rest, dang Andrew. Here’s the thing. You want me to think you’re not crazy, holding to a simply mad view, then you produce ranting comments that I simply have no inclination whatsoever to deal with. I will simply leave you to your own devices, as your behaviour shows that I’m clearly giving your posts more attention than they deserve. You evidently think I have time for this nonsense, but I think that simply as far as evidence goes, I have said what I need to. Andrew, you’re not even thinking straight,. We definitely agreed that Cyprian never quoted the Comma. Where, Glenn? This shouldn’t even be up for debate. Read the actual words. The following is from my last post before you suddenly claimed that we were “agreed” that Cyprian was “not quoting” 1 John 5:7. 2) Second, I did cite Latin authors who were quoting 1 John 5:7, but the quotation by Cyprian demonstrates that this could not possibly be a “4th century homily” as he suggests. 3) Cyprian is obviously quoting 1 John 5:7. How can you objectively claim that he is not? If you can take a clear statement like this and spin it around backwards, why should you be granted any credibility to read statements from Cyprian, Priscillian, Tertullian, and so forth? I don’t understand how I can be expected to maintain a reasonable conversation (let alone a debate) with someone who will lie about what I’ve said while the exact words are still above in black and white. If you are not intentionally lying you must be severely deluded. It is, in my view, diametrically opposed to the learning that can be had through the careful study of textual criticism, and it serves to impede progress in biblical studies. A fine example of “careful study of textual criticism” you have turned out to be. I am the one saying that we should be considering the whole spectrum of manuscript evidence, the quotations of the early fathers, not accepting myths and fables without evidence, and looking to the grammatical issue within the Greek text itself. You’re the one that refuses to look at evidence because you’ve already got your mind made up. That is what I call a blinding prejudice. The evidence is there, you had someone ready to step you through it, and your response is that you “don’t have time” and you continually refuse to address the evidence. It seems that other than lying about my stated position, your remaining defense is to claim I am “crazy” with a “simply mad view.” You have refused to answer questions or even demonstrate that you recognize the basic issues. I doubt that you even looked at the Greek grammar. (28) The heart of the righteous studieth to answer: but the mouth of the wicked poureth out evil things. Maybe there will be others from your readers that will study to answer. I wish them well. The thing about using Scripture to point out the speck in someone else’s eye is that it is akin to making yourself “The Holy Spirit”. Ironically, Andrew claims that being called a “KJV-only’ist” is a slur, and yet a quick google search finds that Andrew calls HIMSELF a “KJV-inerrantist” which is, in effect, the PC way of saying the same thing. It just trying to remove the “baggage” that comes with the term “KJV-only’ist”. Of course, he will no doubt deny that, but that, in effect is proof that it is true. The thing is, a KJV-only or a KJV-inerrancy adherent has an axe to grind, and that is evidenced in Andrew’s writings. Not only here, but on scribed, which you can find by googling his name. Honestly, I cant believe Glenn has wasted this much time. Geoff, it is true that a lot of it was time wasted – because some people deny what is right before them (e.g. saying that so and so quoted a verse when we actually have his words to show that he did not – and we quote him as NOT quoting the verse, then later say that we have quoted him quoting a verse – nonsense par exellence!). It goes around and around and around, whipping up a rhetorical storm of rambling and stumbling over claims. But there’s also a sense in which it’s not totally wasted time. Anyone who came to this thread thinking that maybe there is early mss evidence for the Comma will now see that there isn’t – and they’ll also see a failed attempt to prove otherwise (they will see how careful the KJV only defenders are – getting the Latin Vulgate muddled up with greek texts). That will at least help keep people away from such fanciful thinking and they will be more wary about just believing KJV-obly claims in future. That’s good. Anyone who thinks that the Greek Fathers might have quoted the Comma will now see that as far as we know, they didn’t, and that there are no existing examples of them doing so. Ditto for the other issues raised – yes, defending the views that we have seen defended here is – to put it simply, rather crazy – and while most of it is just a waste of time, there’s still a limited benefit in people who are undecided now seeing the issues raised in public, and seeing just how wrong the advocates of the KJV-only view are (not to mention the tendency to collapse into raving, attacking, accusing screeds of text). Some people who might have been sucked into that view will now not be sucked into it. For that, at least, I’m glad. well, for that reason I too am glad.. I was wondering which side in this would pick up on the Proverbs reference and claim it for their side; either one could, from their perspective claim that the other guy is the fool. Unfortunately for you, Andrew, I’m with Glenn on this (although, I kind of regret posting the reference, because I ought not to go around calling people I disagree with “fools”). I have a close friend who is KJV-Only (and I’m decidedly NOT), and this conversation sounds like many I’ve had with him; it just goes around and around and around and around, and there is no end to the bickering (though, note that I still refer to him as a “close friend”). This is one reason I believe this issue is a major distraction within the church (or at least within certain neighborhoods of the church). A more interesting question might be: how in the world did all this KJV-Only stuff begin? My hunch is that there were indeed a few horribly distorted “translations” created in order to promote some sort of heresy (I’m thinking primarily of the JW’s “New World Translation”). I speculate that along the way some over-zealous defenders of orthodoxy with a penchant for conspiracy theory over-reacted and went on a heresy hunt, ascribing nefarious motives to all who disagreed with them (hence all the accusations of dishonesty, deliberate distortion, etc.). I somehow suspected that Glenn would still try to insert “the last word” even though he said he was exiting. The claim that “manuscript evidence is against 1 John 5:7 is erroneous.” If Glenn hadn’t blown out his logic circuitry, we would have been able to address said evidence. Glenn, you exited the debate with lies and accusations. You cannot now claim that you would have “won anyway” had we been able to continue and address the Old Latin (from AD 150), the full spectrum of quotations from early fathers, internal evidence, and the actual grammar of the Greek text in question. Your proposed reading is an incorrect reading on its face and this is plain to see for anyone who can competently read Greek and who understands Greek grammar! I try to use words with precision. When I said I was a “King James Inerrantist” that means that I have been actively testing the King James translation for any instance of error for over ten years, and this probably constitutes far more serious testing and research than any one of these casual mockers have done. Thus, when I used this adjective, it means that when I say that I cannot find an error in the King James text, it is because I have actively tried to break it. Glenn already demonstrated that the term “King James Onlyist” is used as a derisive slur, and is intentionally made so broad that it is not even useful as a descriptive. Obviously, I use quite a bit more than the King James text, and I probably avail myself of more translations that most of you here. Just drop the use of the slur. If you know it is offensive, why would you continue to use it? I dare suggest that you have far less testing and evidence for your conclusions. When I say that Glenn was lying about what I said, did you not go back and check the posts in question to determine the actual statement? Did you not notice that he was refusing to answer basic questions that would be required to proceed with a normal rational discussion? It is not fair to suggest that I have conjured unfair accusations when they are demonstratively true. You asked when people started considering the Authorized translation as inerrant scripture. I have two answers for you. The first is that there are people who have commented (or complained) that the Authorized text has been treated as inerrant and inspired all the way back to when it was first produced. The second is that it doesn’t matter a bit if one is willing to test a claim on its merits. That’s what I’m failing to see from this group: an ability to set aside their prejudices and judge a thing on its merits. I had to do this myself, so it’s not like I’m asking anything unreasonable. But I am beginning to think that the lot of you are insane, when you call black white, and white black, when you applaud lies, and then accuse the person who objects about being lied about, when you slander people as being “unwilling to look at evidence” yet you yourselves are the ones unwilling to examine the basic elements involved in a challenge you started. Coming back to this again: I don’t think there’s a one of you that has any clue what I’m talking about concerning the Greek grammar, and Glenn made sure he derailed the discussion so none of you could find out. I haven’t heard anyone else ask about it, so I am left to conclude that you don’t care about examining the evidence. Well, I’m not going to dance to entertain a rigged game. If anyone cares, they can ask me directly (follow my web page for an email link) or you can start your own research from the links I provided. Andrew, I never said I was leaving (it’s my blog! ), so I don’t know where that came from. I just said I wasn’t going to interact with what I took to be your screeds of emotional nonsense because I don’t like to flush my time away like that. I will, as always, interact with people at my blog when I see fit. The AV rendering Sheol, Hades, and Gehenna all as “Hell” is an error. You (being someone who holds to conditional immortality) know this full well. My guess is that you’ll try to either 1. define “error” in a ridiculously narrow way, or 2. argue that two utterly different concepts like Sheol and Gehenna can be properly referred to by the same word. I look forward to your rambling, five page reply to this. Bring your A game this time, junior. KJV-onlyist is only a derisive slur if you think it is. I dont think it is, and I am sure Glenn does not either, I certainly dont use it that way. It is merely a term to describe a cult of people who approach Scripture in a certain way. I would suggest you have more problem with it than I do. Well “LOL” to that. I think Glenn has gone way and beyond showing he was correct. And having disbelieved Glenn myself, studying the subject and arriving at the same conclusion despite my need to prove him wrong, I have to say… sorry dude, you failed. Until you give up your KJV agenda, whether its “inerrancy” or “onlyist” (same thing, duh), you can not be objective. Therefore your methodology is flawed, and that pretty much ends the story. This awful choice was certainly not made because they just spoke that way about people and graves. Dualists in 1611 knew what they meant by “soul” and pretty much everyone in english speaking Christendom had a concept of “hell” that was not the grave. I am so grateful that some modern translations have delivered us from such attrocities. Of all of the inane statements that one has got to really take the cake. You do realize that calling someone a “cult” is itself a theological slur? Since you will not define “approach Scripture in a certain way” this makes your evaluation impossible to evaluate. You do not seem to have the courage or the integrity to define what you mean by that statement. But you’re not alone: neither did Glenn. He’s an expert at dodging questions. I still haven’t got an answer from him with whether he considers the text of the original Greek autographs to be inspired! (27) because thou wilt not leve my soul in hell nether wilt suffre thyne holye to se corrupcio. William Tyndale is on the record as being one of our most outstanding champions of what you call “Conditional Immortality.” William Tyndale rendered sheol, hades, tartarus, and gehenna as the English word hell. One could say that Tyndale agrees with the Authorized Translation, but it’s really more accurate to say that the Authorized Translation agrees with William Tyndale. I think you should stop and learn what the English words “soul” and “hell” actually mean, before spouting any more nonsense. You have fallen into a trap of believing the lies of your enemy, and letting them re-define the words for their own advantage. I am reminded of a joke, where two Kiwis are building a house. Every now and then one of them will reach into his bucket, and toss a nail over his shoulder. “Wait a minute, what are you doing that for?” asks his friend. Truthfully, were the nails actually in error, or was it that the Kiwi did not properly understand the function of nails? Should we not be skeptical when someone comes up with a “solution” of nails with heads on both sides, so they can be used by Kiwis that can no longer be expected to know how to use these old-fashioned nails? Stop throwing away the nails, and if you cannot figure out how to use them properly, at least save them for the other side of the house! And what was your suggestion? “Start introducing mythological places named “Hades” and “Sheol” into the scriptures?” Do you know what “Hades” actually means when used in normal English speech? It’s the abode of a Greek god who tortures its occupants! Even if you attempt to ignore this connotation, it remains a Place designated as a Proper Noun. Ironically, right now I am engaged in a debate with an Eternal Conscious Torment Calvinist who has allowed that the language of my Authorized Text, as read in Modern English, uses language that completely annihilates the devil. He claims that his “modern translations” fixes this “problem” because his versions render the devil immortal and the eventual victim of Eternal Conscious Torment. I am also hearing unfounded claims from all sides that are ignorant of what they criticize. For example, Queen Elizabeth revised the laws of the church, ruling that their preachers should only preach what was in the Bible, and also removed the previous rule that required teaching the “immortal soul.” And if anyone here has ever read any of the writings of the King names James, you might find that he sounds a lot like modern day “Conditional Immortality” folks. And let’s not forget that 80% of the Authorized Text was first written by William Tyndale! How many poor souls perished on that bitterly cold clear night? For that matter, the very existence of the term “immortal soul” demonstrates that the word “soul” does not indicate something immortal, which is why they have to attach the word “immortal” to it. In our example from the Titantic forum, it is acknowledged that souls perish. You all could benefit so much from learning basic vocabulary and grammar. Likewise, why are you letting your opponents redefine a word like “hell” for you without so much as a fuss, instead of insisting that they use it in the fashion as it is used in our Bible? It is a well-recognized truism that the key to winning a debate is to define your terms. I let my Bible define its own terms. It works remarkably well this way. Hell is where things are “cast out” and as such it usually represents death. It makes no difference whether this is the first death or the second death, because death is still the total annihilation of thoughts and consciousness regardless of the cause of death. If you don’t understand the author’s meaning here, think about it a little more closely. There is a slight difference between “grave” and “gravedom” even if the two words are related. I’m not sure if you caught that, so I’ll be clear. Hell is not a fire by itself, rather hell is going to be cast into the fire, and set on fire, during the day of judgment. Hell is closely linked with “death” as can be easily observed from its parallel structure in this verse. And when you combine “hell” and “fire” you get “hell fire.” This is so simple. I am continually amazed at the unchristian behavior I see on this blog. You are acting like a pack of unashamed bigots: you rail and mock, you don’t even bother pretending to be open-minded, and then you actually brag about your ignorance. And when I say that you brag about your ignorance, I mean it. I notice that still no one has attempted to read any version of 1 John 5:7 in the actual Greek. How is this that any of you have deluded yourselves into thinking that you have attempted to evaluate all the evidence? (21) Ye have herde howe it was sayd vnto the of ye olde tyme: Thou shalt not kyll. For whoso ever kylleth shall be in daunger of iudgemet. (22) But I say vnto you whosoever is angre with hys brother shalbe in daunger of iudgement. Whosoeuer sayeth vnto his brother Racha shalbe in dauger of a cousell. But whosoeuer sayeth thou fole shalbe in dauger of hell fyre. (24) leue there thyne offrynge before the altre and go thy waye first and be reconcyled to thy brother and then come and offre thy gyfte. Unfortunately, William Tyndale rejected conditional immortality. Unless there’s an important source that I’m not aware of, he affirmed the torments of hell taught by the majority. He did affirm soul sleep, however (but I’m fairly sure he was a dualist nonetheless). It’s a shame that he adopted the misleading language of his age with words like “hell” and “soul.” The modern translations are vastly superior on that score. Anyone who has actually read the theological writings of those who lived in the days of Tyndale knows that they did indeed use “soul” in a dualist sense and “hell” to refer to a conscious state after death. Just look at the works of those who affirmed those things, and you’ll see that the language is the same. Much better language was available to Tyndale. As I have explained here at this blog, Tyndale himself complained at the fact that there was one word “hell” used to translate both Sheol and Hades (or the Latin infernus) on the one hand, and Gehenna on the other, and felt the need to step in and explain the distinction. Given this, I don’t know why he didn’t just use better terms. Tyndale ought not to have used language of his peers. Odd words from someone who claims to like to use their english “correctly”. “Cult” is a term that can refer to any religion, or subset of persons within a religion. Those of us who have studied the OT will have read countless times, scholars referring to the religion of Israel as “the cult of Israel”. They did not mean anything bad by it, its just a term to refer to their belief system. In this case I CORRECTLY used the term to refer to a “subset of Christians” who believe (in an inaccurate/false/unorthodox manner) that the King James version of the Bible is inerrant/the only version that really contains God’s words. Yet again, its not a term meant in a derogatory manner, its just an accurate, normal, descriptive term. Any baggage associated with it is purely on your side. I look forward to your rambling, five page reply to this. Unfortunately, once again you wasted hours upon hours looking stuff up on google, and typing out a long, irrelevant response. Nothing you wrote in any way controverted the simple fact that Gehenna and Sheol are utterly different concepts, and that translating them with the same English word is therefore an error. Yes, I “rambled” for a whole five sentences. See, what you tried to do there was emulate me by employing a word that I used to describe your writing to describe my writing. You failed miserably. Andrew, if you think that a word like “rambling” can properly be used to describe a handful of concise sentences, then how can you possibly hope to understand more complex questions of linguistics and translation? I’m not impressed. I never said anything of the sort. Please stop lying Andrew; that’s not very Christlike. I could go on for pages and pages just for the joy of it– but little would be gained (other than said joy). Your long reply was utterly irrelevant. It’s irrelevant what view Tyndale had of the final state. It’s irrelevant which translation is the “best” to “prove” conditional immortality. It’s irrelevant that you’re a crybaby who can dish it out but can’t take it. 1. Using a single word to describe two utterly different concepts is a basic translation error. 2. Sheol (or Hades) and Gehenna are utterly different concepts. 3. The AV translates both Sheol and Gehenna as “Hell”. 4. Therefore, the AV commits a basic translation error. Stop wasting my time, and try to do the impossible by demonstrating that 2 is false. You are no truth-seeker, Andrew. You’re an ideologue. I am continually amazed at the unchristian behavior I see on this blog. Me too, some people here lie a lot. FYI, in America, the word cult is popularly used to refer to aberrant offshoot religions– similar to how the word sect is used in England (and I’m assuming other Commonwealth countries). It is also used the way you mentioned, but in my estimation, less commonly, or only in certain contexts. I do think Andrew showed his bias by being hasty to assume you were using the pejorative, American sense of the word. However, Andrew claims to like English used accurately, so I did. You seem to have neglected a very important resource. Like William Tyndale. What can we glean from this passage? I read the entire text of “An Answer to Sir Thomas More” several years ago, complete with the unusual sixteenth-century spellings, just to make sure these famous quotes were really there, and not taken out of context. It had all this, and much more. Maybe you don’t understand this, but when a Christian says that death is a sleep, that is the essence of “conditional immortality.” The wages of sin is death, and the punishment of the lake of fire brings the second death. And even the error itself has, I see, been aggravated. At first, some only vaguely alleged THAT THE SOUL SLEEPS, without defining what they wished to be understood by “sleep.” Afterwards arose those yucokonoi, who murder Souls, though without inflicting a wound. The error of the former, indeed, was not to be borne; but I think that the madness of the latter ought to be severely repressed. Both are unsupported by reason and judgment; but it is not so easy to persuade others of this without openly refuting their vanity, and exposing it, so to speak, to their face. This is only to be done by exhibiting it as it appears in their writings. They are said to circulate their follies in a kind of Tracts, which I have never happened to see. I have only received some notes from a friend, who had taken down what he had cursorily heard from their lips, or collected by some other means. John Calvin admitted that although he could only refute this “nefarious herd of Anabaptists” by addressing their arguments as it appears in their writings, he then admits that he is answering without bothering to ever read any of their writings. That reminds me a lot of the Beretta blog, for some reason. … (but I’m fairly sure he was a dualist nonetheless). And what would that have to do with anything? You imply this as a slight. We are more than raw matter. Have you not read the scriptures? The scriptures use these terms, and they are not always synonyms. It’s a shame that he adopted the misleading language of his age with words like “hell” and “soul.” The modern translations are vastly superior on that score. When people start making up their own doctrines about the meaning of death, that is the source of confusion. The correct solution is to counter the false doctrine that the soul is immortal, and prove this by the scriptures. False teachers are misleading, and although they may use all sorts of words, the answer is not to ban the dictionary! Peoples of all cultures and religions understand “hell” as the realm of death, but not everyone agrees with how the word is interpreted or applied in context. Hebrew and Greek are filled with words that require interpretation from context, and English is no exception. Have you failed to notice that the Eternal Conscious Torment theologians have a field day with interpreting “Sheol” and “Hades” and “Gehenna” as different locations? Your so-called problem is a result of intellectual laziness, and your so-called solution has already been tried and failed. Anyone who has actually read the theological writings of those who lived in the days of Tyndale knows that they did indeed use “soul” in a dualist sense and “hell” to refer to a conscious state after death. And what theological writings are you bragging about reading? It doesn’t seem like you’ve taken much care to read Tyndale, even. Besides Tyndale, and John Frith, I’ve also read the writings of King James. He speaks of the soul remaining in its own resting place, until the latter day. King James did not say that the souls of the dead are alive, or in heaven. Does “the Daemonologie” count as a theological writing of that day? … and besides that, the soule once parting from the bodie, cannot wander anie longer in the worlde, but to the owne resting place must it goe immediatelie, abiding the conjuction of the bodie againe, at the latter daie. What more is the reste troubled of a dead bodie, when the Devill carryes it out of the Grave to serve his turne for a space, nor when the Witches takes it up and joyntes it, or when as Swine wortes uppe the graves? The rest of them that the Scripture speakes of, is not meaned by a locall remaining continuallie in one place, but by their resting from their travelles and miseries of this worlde, while their latter conjunction againe with the soule at that time to receave full glorie in both. You should see what he says concerning those that claim that Saul was actually seeing the real “spirit of Samuel”, which is a traditional “anti-soul-sleep” argument that is still being used to this very day! As to the next, that it was not the spirit of Samuel, I grant: In the proving whereof ye neede not to insist, since all Christians of whatso-ever Religion agrees vpon that: and none but either mere ignorants, or Necromanciers or Witches doubtes thereof. It would seem that King James would consider modern theologians that use said passage to dispute that the souls of the dead sleep until the resurrection as “mere ignorants.” I’ve even heard that argument from people who give King James lip service! Perhaps you were too prejudiced to notice this previously. Or perhaps you never thought to read these types of writings to see if these folks were really biased in the way you claim. I dare suggest both. I imagine that you would probably continue to criticize William Tyndale, for even using the term “hell” in the same context as put forth by Sir Thomas More. Contextually, this “hell” that Tyndale spoke of was the mythical Roman Catholic hell. This is clear from context. Jesus here uses the word hades in the context of fire and torments. Why don’t you criticize Jesus for speaking of this mythological Hellenized hell (capitalized Hades) in this fashion? Shouldn’t he have picked a better word? Surely you are wiser than Daniel, so you might well correct Jesus too. Just look at the works of those who affirmed those things, and you’ll see that the langueg is the same. Much better language was available to Tyndale. Tyndale was proficient in eight languages. He was far more talented in this regard than you, and far more qualified to translate the scriptures. He gave everything he had, including his social standing, his inheritance, his education, his work, his safety, his own life, and the life of his friends. The language that Tyndale chose shaped the future of the English language. “Hell” and “soul” are the correct words, even if you are so theologically deficient to be unable to figure out how to use them. You continue to make a plea based upon a case of ignorance. As I have explained here at this blog, Tyndale himself complained at the fact that there was one word “hell” used to translate both Sheol and Hades (or the Latin infernus) on the one hand, and Gehenna on the other, and felt the need to step in and explain the distinction. I took a look at your referenced blog. It was one of the most irresponsible pieces on William Tyndale that I have ever seen. Your supporting source is a partial quote, taken out of context, ignoring all of his plain statements on this matter, and twisted to misrepresent Tyndale’s doctrinal stance all together. Not that any of your readers noticed, but your link to your source returns a 404 Not Found error. I suspect that your source was simply the one-page preview from Google books. Hell: it is called in Hebrew the valley of Hennon. A place by Jerusalem, where they burnt their children in fire unto the idol Moloch, and is usurped and taken now for a place where the wicked and ungodly shall be tormented both soul and body, after the general judgement. What has Glenn implied here? He would have us read this as “tormented without end of life” to comply with his accusation of William Tyndale. After all, if he cannot be expected to read Cyprian and recognize a clear quote of 1 John 5:7, and he will claim that I have “already agreed” with him when when all I have done was to loudly protest to the contrary, then how can we expect him to honestly represent what Tyndale meant 500 years ago? He has demonstrated a strong external bias against all of these parties. Considering that Tyndale strongly decried the heathen doctrine of “immortality of the soul” and multiple times gave strong statements that we sleep in death, and that our hope is the resurrection, this is not a contradictory statement. “Conditional Immortality” does not mean that the wicked shall be whisked out of existence without torment. They shall be bodily resurrected, face judgment, and he shall destroy body and soul in hell. Given this, I don’t know why he didn’t just use better terms. Tyndale ought not to have used language of his peers. Tyndale didn’t use the language of his peers. That would be Latin. He translated the Bible into the language of the people, into English, in words they commonly understood. I suppose if you were trying to translate the Bible, you would invent totally new words. And when a Sir Thomas More came along and put a spin on those words, you would make a new translation, and keep trying to stay one step ahead of him? Hell has always been the realm of the dead, the grave, the ground, where things are unseen, representing death, decay, and destruction. Soul has always been the actual man, the essence of our being. We are obviously more than our sum of material parts, and this is apparent to anyone who reads the scripture, or even for someone who acknowledges free will and has taken an introductory philosophy course. Without a spiritual component, we are biological wind-up machines. (28) And feare ye not them which kyll the body and be not able to kyll the soule. But rather feare hym which is able to destroye bothe soule and body into hell. Interestingly, the term Hell itself is pagan in origin, deriving from Old Norse Hel, the goddess of the realm of the dead and the underworld in Scandinavian mythology. Hmmm….. it’s the English version of the Old Greek Hades! How is this an innappropiate translation now? Weren’t you suggesting that only gehenna should be translated as hell? However, the word appears (as helle ) in Old English about 725—that is, after the conversion to Christianity—in Ælfric’s version of Genesis 37:35: “ic fare to minum sunu to helle” (“I will go down into the grave unto my son mourning” in the King James version). Hell is only used literally in Anglo-Saxon. You were tossing around labels like “intellectual black hole” and accusing others of being “diametrically opposed to learning.” It seems to me that this is a more apt description of yourself. Is it not written, that we should take the beam out of our own eye, before attempting to remove the speck from another? You should also substantiate your claims before publishing them on your blog. If you are concerned with intellectual honesty, you should retract your “Tyndale” blog. Your accusation depends upon adding the word “immortal” when he is famous for stating that the soul is not immortal. If you prize scholarship so much, then start doing your own research. And yes, this is a long post, but I prefer to say this only once, since I have no desire to banter back and forth with you or your fanboys any longer. Anyone who disagrees with you here is a Peoples fanboy? Silly. Looks like you’re lashing out in anger there. Very Christlike. The Bible describes Sheol/Hades as the fate of everyone immediately after death. The Bible describes Gehenna as the fate of the wicked only, and is a place of burning where the wicked are destroyed. They are utterly distinct concepts. This fact is acknowledged by every Bible scholar, commentator or exegete that I’m aware of– including those who hold to conditional immortality/annihilationism. Not only are you not seeking truth; you are positively a liar. And I’ve demonstrated it more than once. And now that I’ve demonstrated it you are running away. So after some irrelevant quoting from Andrew, there’s not a single piece of evidence that Tyndale believed in conditional immortality. I wish there were some. It would be nice to have him on “our side.” For some reason, some conditionalists seem to think that the mere fact that Tyndale believed in soul sleep proves that he was an annihilationist too. He wasn’t. Still, soul sleep is an improvement on the majority view. The same false claim is sometimes made about Martin Luther, who also affirmed soul sleep. However, he too held the traditional view of hell, shared by his peers. The truth is not helped when we use falsehoods to defend it. It’s absolutely obvious that the issue was not the etymology of the English word “hell.” The issue is what it meant to Tyndale’s English speaking peers. By using their language, Tyndale gives a patently false imrpession. No brand new words needed to be invented. They already had the english word grave, or pit, or death, or whatever context requires. He could have used it, but he inaccurately used “hell” instead. Thankfully, modern translations avoid much of this. Not all, but much of it. What on earth are you all carrying on about? It is designed, accordingly, to appeal to the heart, not the head. It’s my own feeling that the King James Version uses the language of poetry more effectively than (say) the version used by Jehovah’s Witnesses — but that is as far as it goes. And it is true, therefore, in the sense that all poetry (indeed, all art) shows us the truth. As a specific instance, look at the tale of Adam and Eve. The truth it propounds, and does so in a fashion which can be grasped by a child, is that we cause ourselves nothing but trouble when we decide that we have the right to decide for ourselves what is right and what is wrong instead of simply listening to what we know to be the case. That fatal decision — one which we can see to be fatal from its results elsewhere — is what is represented by the forbidden fruit. Do you see? Poetry is a way of saying something, and is nearly always true. Martin, the issue studied by textual criticism is not whether or not the Bible is true. Instead, it studies the evidence to determine which manuscripts are closer than others in content to the original autographs, and by comparing all the available manuscripts, ancient quotations and other available material, it seeks to make judgements on what the original autograph most likely said. “O cuckoo! Shall I call thee Bird?